A first experiment in spiral plying. Have you ever had one of those problems, that no matter how hard you try to solve, just keeps coming round again? “Here I am again,” you think, as your previously-vanquished foe returns yet again. “It’s a vicious circle,” you think. You think of going round and round and round, never escaping. But what if that circle were actually a helix? And you’re not returning to the same spot, but climbing up, learning something new each time, gradually working your way to the surface. Composition: Merino plied with polyamide thread. Length: 233m / 255yd approx. A few weeks ago, the rather marvellous Verity from Truly Hooked  sent me a braid of dyed merino to test. Never one to turn down free fibre, I jumped at the chance! 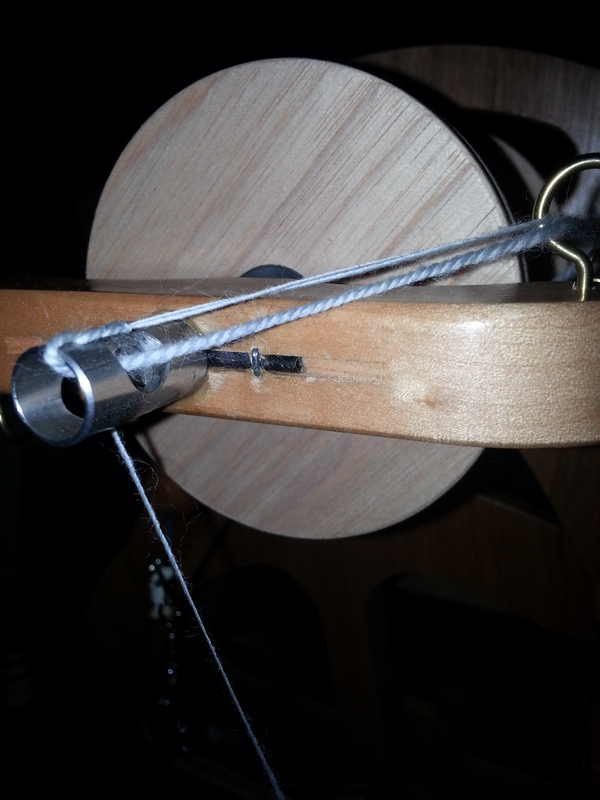 I spun up the single and sent my feedback to Verity, and then it sat on the bobbin for a few weeks whilst I pondered on what to do with it next. In the end I decided to experiment with some of my plant fibre stock. 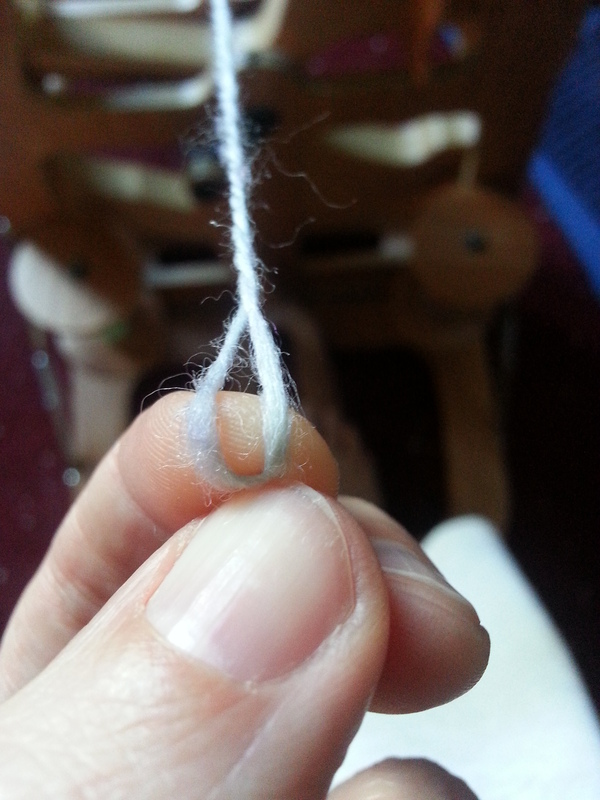 I spun up 50g of banana silk to ply with the dyed merino. I was hoping that the delicate colours of the original braid would be enhanced by the pure white sheen of the banana fibre. I absolutely love the result! I cannot possibly capture the delicious lustre of this soft and silky yarn on camera. It is heavenly and I adore the look of the oh-so-delicate colours. I have named this skein “Sea Foam”. Now, I still had a fair bit of the merino single left. I had spun the merino very fine, with a high twist, but the banana fibre drafted differently (bananas act differently to sheep! who knew?!) and, once I stopped fighting the fibre and actually worked with it, the single became smooth but somewhat thicker than the merino, and therefore made a shorter single. 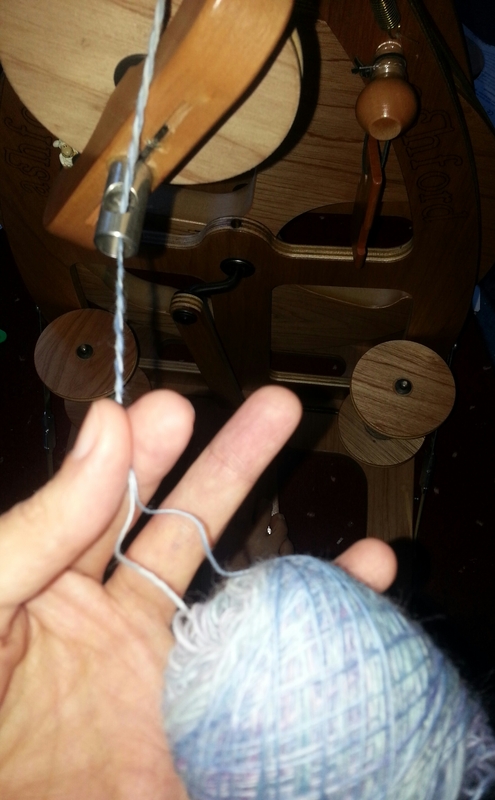 I had my lovely Sea Foam skein, and a bobbin still partially filled with merino. Time for a new experiment. 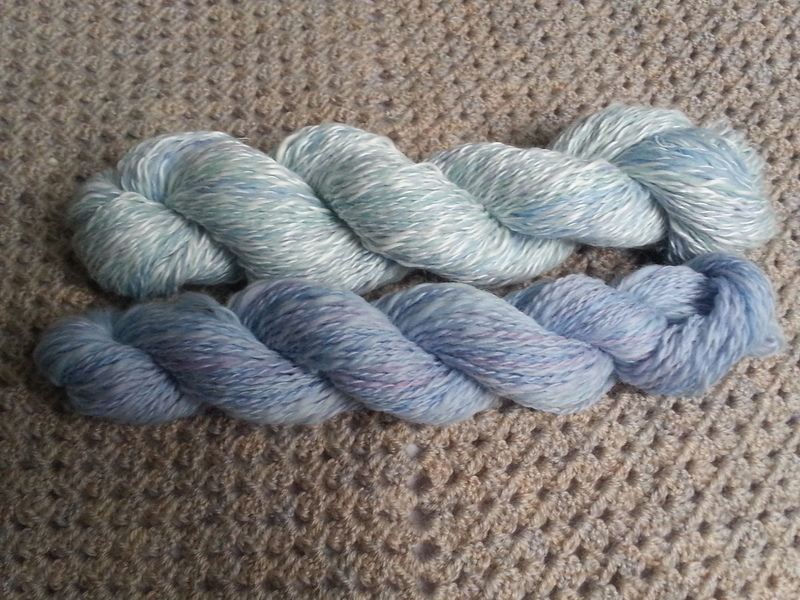 Two beautiful, and very different skeins made from my original braid. Sea Foam, meet Harebell.